I’ve only seen one pattern for tunisian longies/shorties, so I’ve been wanting to do this for a while 🙂 I’m pretty excited about it! 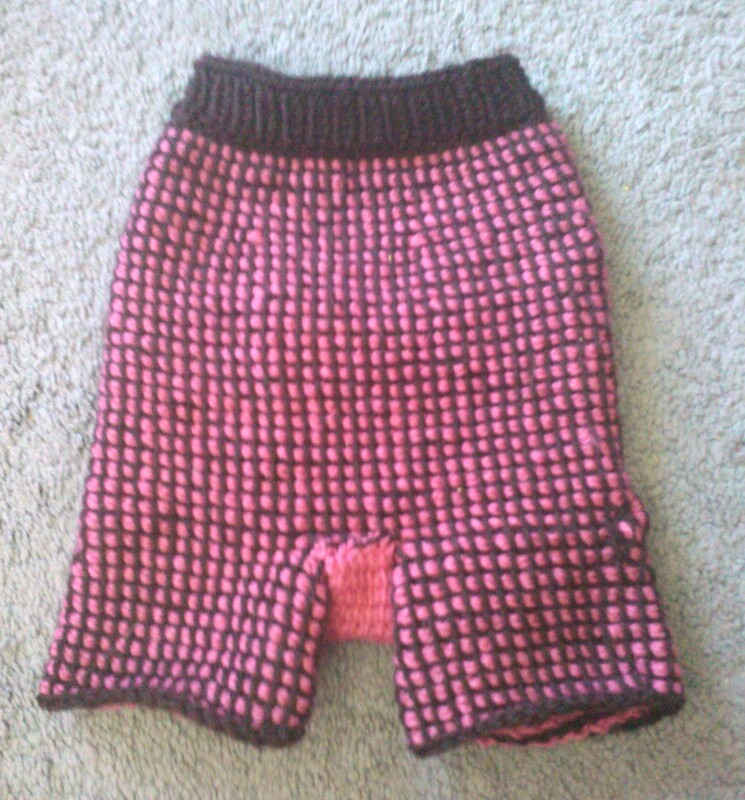 I’ll be making a second pair for DD that are cotton, so she can have some comfy summer shorts too. Baby booty! Without a cloth dipe, so a lil saggy. 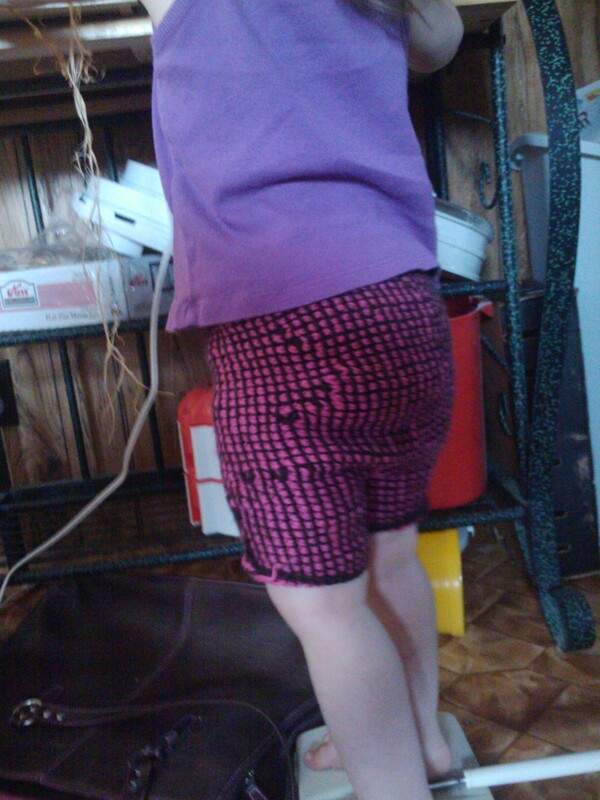 Size is for a toddler, about a 2T. and I’ll have to find my notes on rise and such. Waist is about 19 in, rise 22 in give or take. Feel free to add more or take away in the short rows as you need. WW wool yarn in 2 skeins-I used Patons, which is also on the lighter side of worsted, just to let you know. Note-wordpress is apparently really special when it comes to changing font, and I wrote the pattern notes on my DH’s computer, which does not have word on it, and when I copied and pasted it made my font tiny and apparently impossible to change without knowledge of html. sigh. 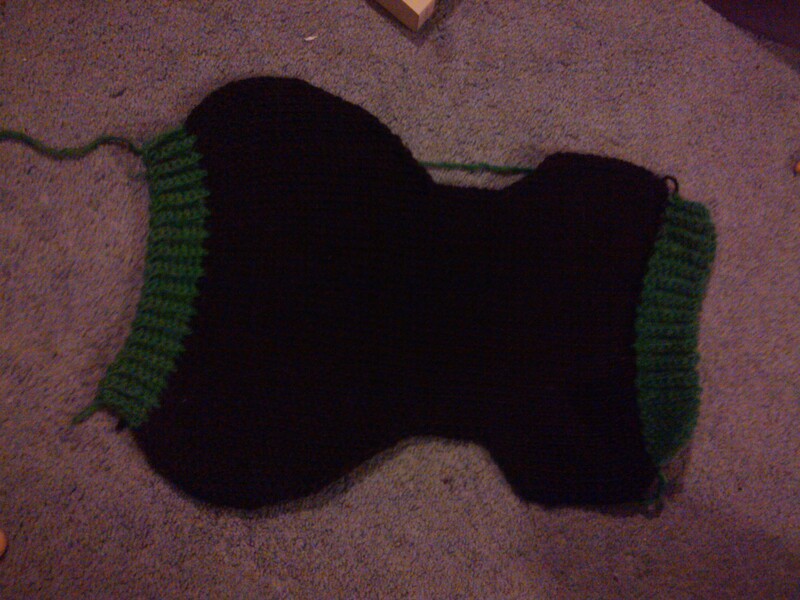 ch 60 with first skein, sl st into back hump of first ch to join into round. Round 8: Work even to 10 sts before end (1st marker), work return pass to 10 sts before 2nd marker, forward pass to end. Round 9: Work even to 9 sts before end (1st marker), work return pass to 9 sts before 2nd marker, forward pass to end. Round 15: Work even to 8 sts before 1st marker,return pass to 8 sts before 2nd marker, forward pass to end. Round 22: This row will have a short row section on the back side- Work even to 6 sts before 1st marker, return pass to 6 sts before 2nd marker, work forward pass to 4 sts before 1st marker, return pass to 4 sts before 2nd marker, forward pass to 1 st before 1st marker, return pass to 1 st before 2nd marker, forward pass to end, return pass to 2nd marker, forward pass to end. Find middlemost 11 sts on the backside. With rs facing, join yarn to first of 11 sts and work a tss forward pass. Return pass as normal. Next row: tss across, do not return pass! Graft the gusset to these 6 sts using your favorite method-I used kitchener actually! 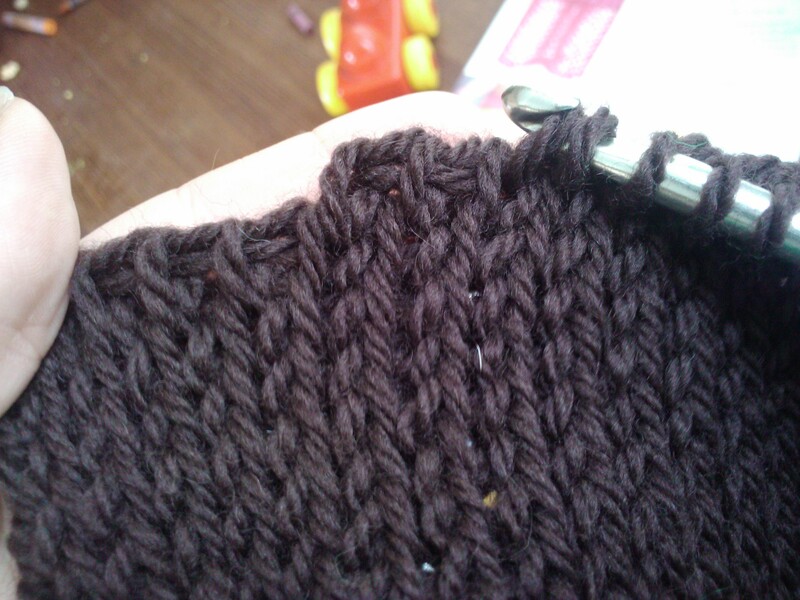 The 6 sts are still ‘live’ so I worked it just the same as knit sts. 🙂 knitty.com has a good photo tutorial if you are unfamiliar with it. If you did not break your yarn, this first leg is slightly easier. This should also be the right leg. 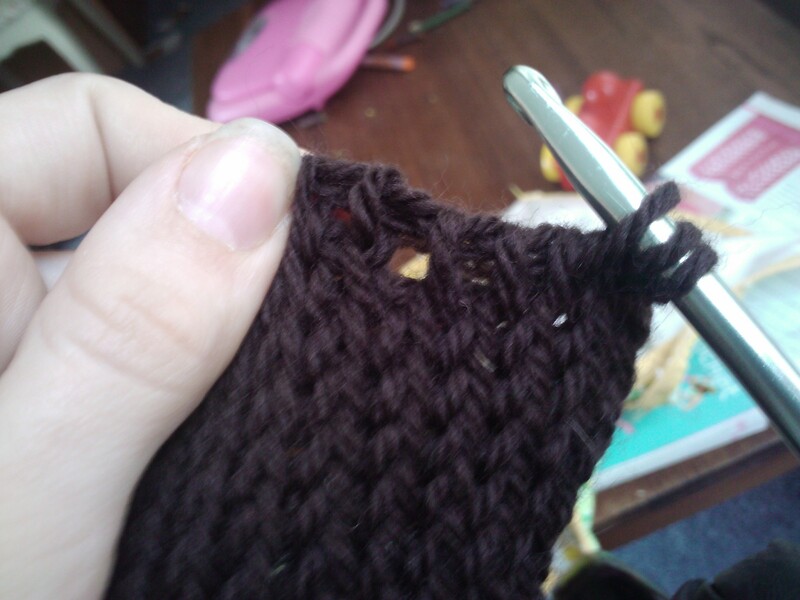 Grab up your yarn again, work a forward pass (13 sts) to gusset, pick up 10 sts along side of gusset, forward pass to end (11 sts) You should have 34 sts. Rounds 1-9: work even around. 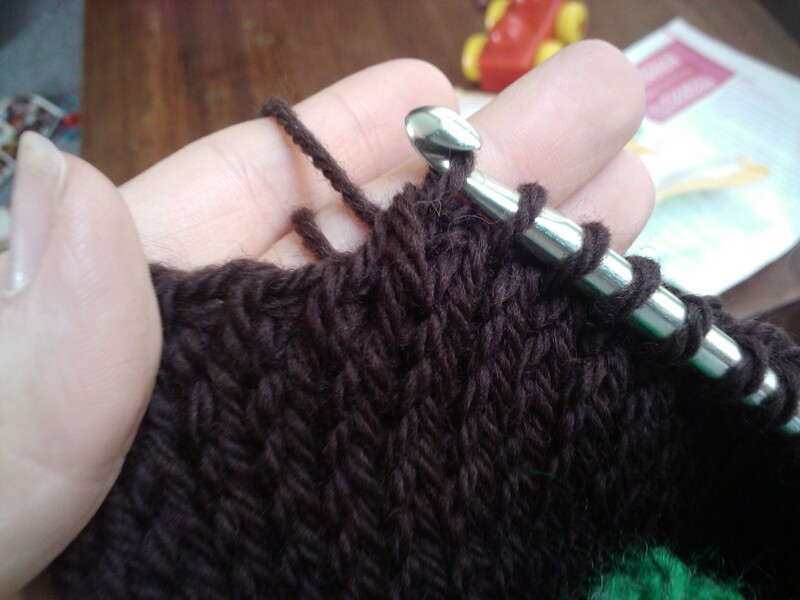 Round 10: work a bind off row. 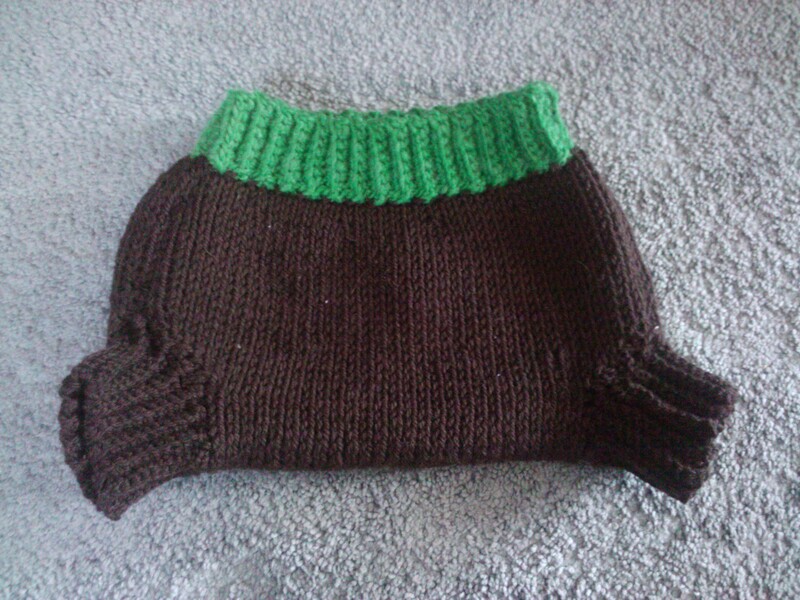 Note-if not adding a trim or ribbing, I’d recommend binding off in tps (tunisian purl st) to help control curling. 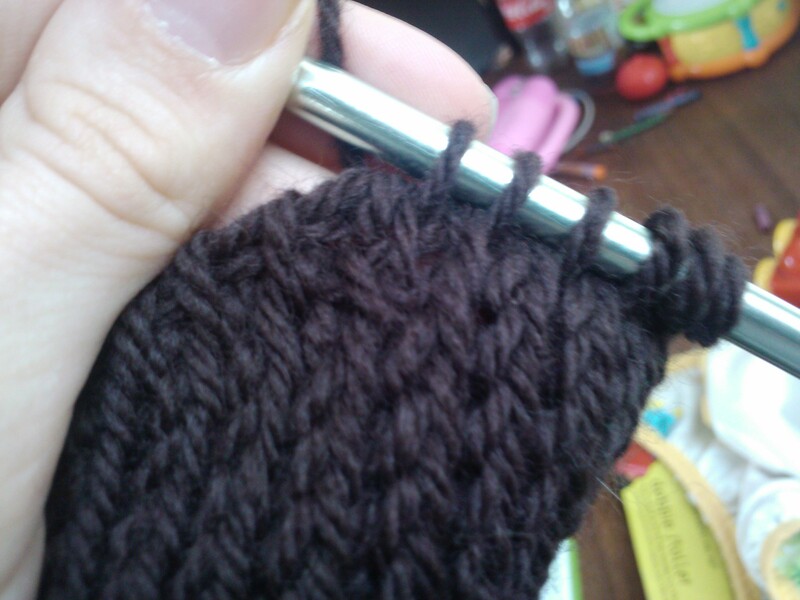 Attach yarn to other leg at marker, and work as for right leg. 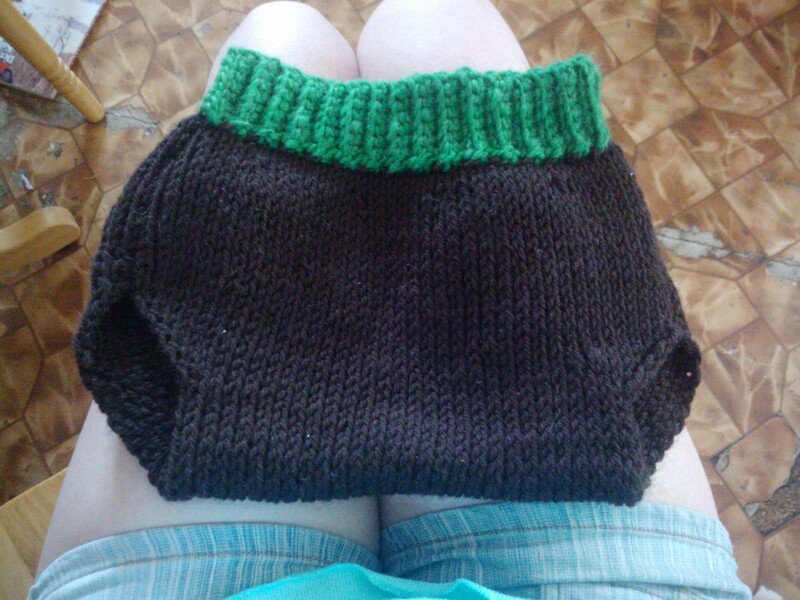 Work whatever typing of ribbing you like at the top of shorties-I picked up sts and worked 1×1 ribbing in knitting for 6 rows. 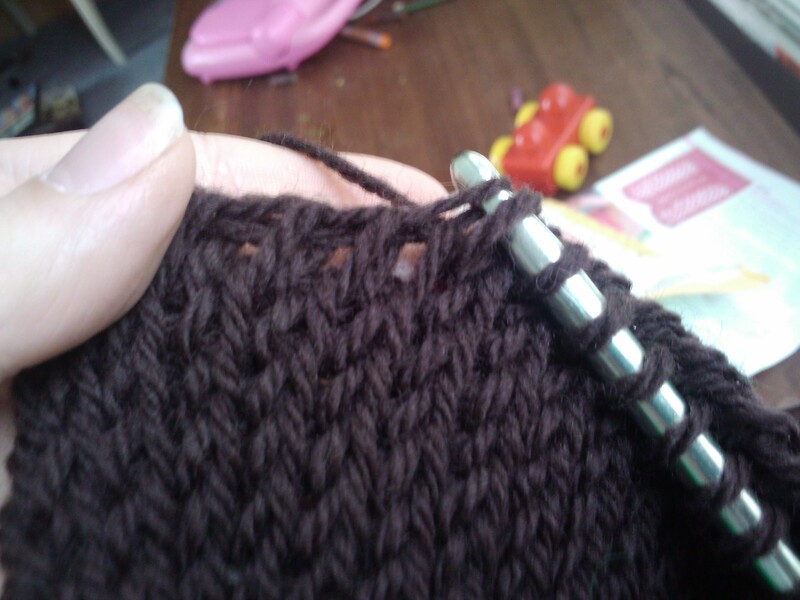 You could do slip stitch ribbing in crochet, fpdc/bpdc ribbing, sc ribbing, or a drawstring of some kind. All up to you! Make the legs longer and turn these into longies! 🙂 Make them yours! 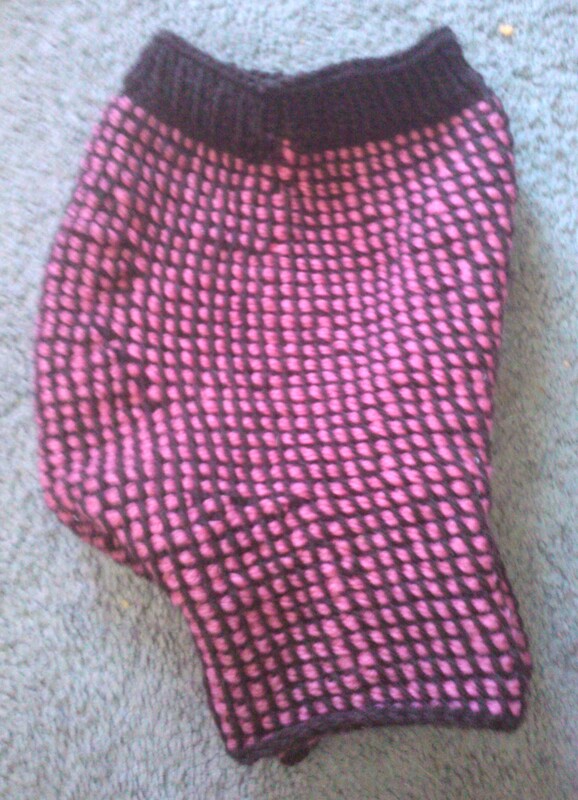 I’ll post more pics after I try out a cotton pair too. 🙂 enjoy! And please buzz me with any questions you may have.